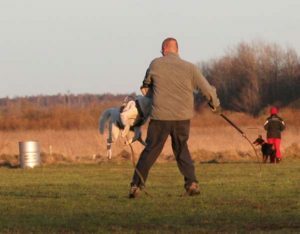 Obedience – obedience is the most simple training area of all where ALL the white shepherds owners should be participating with their dogs to get control over. There are at least one type of obedience in every country around the world which the dog owners might find information about in their respective dog sport organisation. Tracking – tracking is a technique in which dogs are trained to follow a track and locate certain objects, such as articles, toys or animals. In different countries are also several different types of tracking – in forest, on fields etc. Protection – protection is a courage test of a dog where the dog should show its ability to protect the owner and at the same time remain under owners control. IPO – is already a higher level dog sport that combines all the three before mentioned areas and certainley needs from the dog protection ability and strong nerves. The dog that has got IPO result is already a high level trained dog. However, IPO has three levels and depending on the level the dogs are evaluated. Agility – Agility is the most fun dog sport both for the owner and the dog and suitable for all dogs. In this sport the dogs should pass the obstacles such as barriers, jumps, tubes etc. In competitions the fastest dog without errors is the winner. Flyball – Flyball is a dog sport in which dogs race against each other to catch and bring the ball to their owner. In this dog sport teams compete with each other and it is suitable for dogs with good prey drive. Flyball races match two teams of four dogs each, racing side-by-side. Each dog must run down the jumps, trigger a flyball box, releasing the ball, retrieve the ball, and return over the jumps. The first team to have all 4 dogs finish the course without error wins the heat. Search and Rescue – thats one of the most common dog training area for white shepherds all over the World. There dogs are trained to find lost and missing people. It’s not a sport but group of volunteers that also act when needed in real life and sometimes in disaster area. Almost all white shepherds are excellent in Search and Rescue area with their fearless attitude of high high areas and dark rooms, low agressiveness, excellent tracking ability and ability to do the work independently. Herding – herding the sheep. Also a very good sport and working area for white shepherds because of their natural herding instincts. Only a bit problematic in Europe because of the very few sheeps in most of the countires around.